Fill a sink with water that is deeper than your cans are high. Put the two cans in the water. You should find that the diet can floats and the sugary one sinks. Whether something floats or sinks is all to do with how much it weighs for its size - its density. Large and light things tend to float, while small heavy things tend to sink. To be more precise, if something is heavier than the water it is taking the space of it will sink, otherwise it will float. The two cans are exactly the same size and sealed so the only thing that could affect whether they float or not is how much they weigh. We weighed both cans and noticed a significant difference. This means that the sugary drink is 12g heavier for the same size of can, which makes it heavier than a can's worth of water and it will sink. 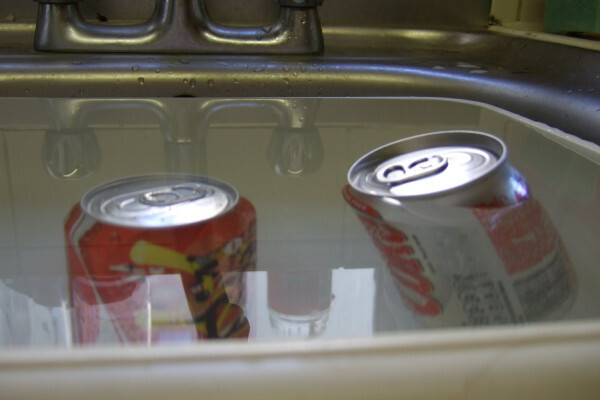 Both cans have the same amount of upthrust from the water as they are the same size, but the sugary can is heavier so overall it sinks. Why is a can of sugary drink heavier than a diet one? It is all to do with how they are made sweet. The sugary can as the name suggests uses sugar, about 35g of it, to give it that sweet taste people seem to love. On the other hand diet drinks use sweeteners to provide the sweetness. Sweeteners are molecules which trigger the same receptors on your taste buds as sugar does, but they stick much better and stay on for much longer than a sugar molecule does. This means that a gram of a sweetener such as aspartame tastes 180 times sweeter than sugar, so you need to add far less of it. Sugar is about 1.6 times as dense as fresh water so a mixture of sugar and water will be denser than water and so sink. The cans are made of metal why do they ever float? The cans are made of metal (either aluminium or steel) which should sink and they're filled with a liquid, so they should sink. However the machines filling them will leave a bit of space at the top (to reduce spillages) so when the lid is put on there is a little bubble which is large enough to counteract the weight of the can itself.